"You might see land masses and mountains made up of diamonds," the lead researcher Dr Nikku Madhusudhan told BBC News. The study in Nature journal raises new questions about how planets are formed. The work has been described as an astonishing astronomical tour de force. They have detected the thermal radiation (heat) from a planet 1,200 light years away using Nasa's Spitzer Space Telescope. From this information they have calculated the composition of its atmosphere, according to Dr Marek Kukula of the Royal Greenwich Observatory in London. "It is absolutely astonishing that these scientists are able to start to tease out the details of what planets around other stars are made of," he said. "The planet is thousands of times fainter than the star it orbits. So the scientists have to perform an amazing feat of precision measurement to extract anything at all. The fact that they are able to tell us something about the composition of this particular planet is quite literally out of this world." To date astronomers have discovered more than 500 planets around other stars. These distant worlds are known as exoplanets. It is only recently that instruments and analysis methods have become powerful enough to discern their composition. This new planet, Wasp 12b, is the first to have more carbon than oxygen. It is a so-called gas giant, like Jupiter, and is mostly made from hydrogen gas. But the planet's core could be composed of some form of diamond, graphite and other carbon compounds, possibly in liquid form. This discovery suggests there may well be many Earth-sized planets in our galaxy that are ultra-rich in carbon. But these worlds would be unlike our planet: "Theoretical studies suggest that they could be dominated by diamond and graphite rocks," according to Dr Madhusudhan. "That would mean that in the mountains, a large fraction of the rock mass could instead be made of diamonds and lots of land masses rich in diamonds, much more than we see on Earth." These planets would be lacking in water So, if temperatures were sufficiently high, liquid on their surface would consist of carbon-rich compounds, such as tar, he says. So how common are these diamond planets? The short answer is that astronomers simply don't know. But the fact that they've discovered one means that they'll now start to try and find an answer. Dr Madhusudhan believes that they could be common. "It's my strong belief that a fair fraction of the exoplanets we have discovered could be carbon-rich and it's a very interesting thought that on such rocky planets, sand could be a rare commodity and diamonds would be plentiful. 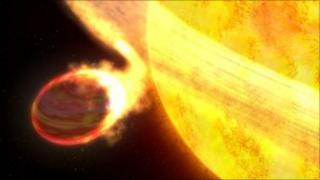 The more important question is how such planets could form." An immediate question that is raised is why Wasp 12b is so much higher in carbon than the planets we know about. The prevalent theory is that plenty of water ice was available when the planets in our Solar System formed. That could not have been the case for Wasp 12b.